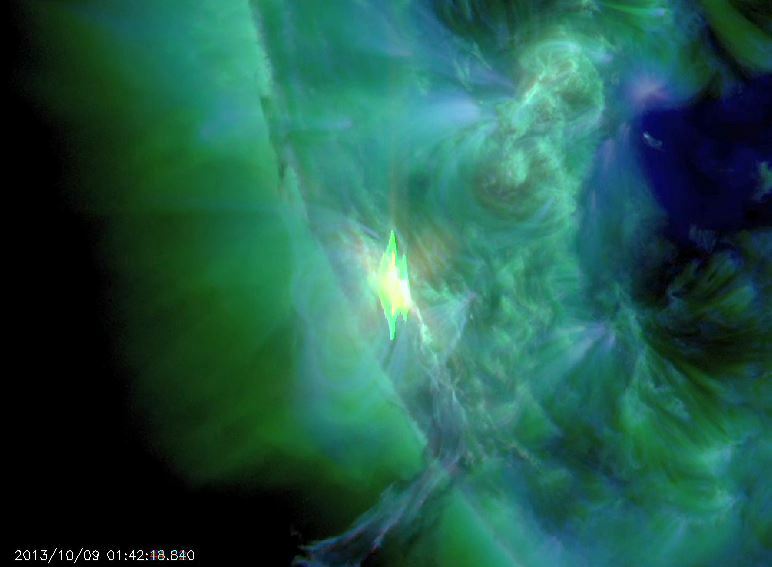 Like a breath of fresh air or a rain shower/flower in the desert, the first reasonably strong solar flare in a long time occurred around 9:45 PM EDT last evening, Tuesday October 8, 2013. It has been weeks and weeks since a flare of this size (M2.8) took place. As I have written many times in this blog, in my experience the hallmark of solar flares on the personal level has always brought for me internal change; something moves inside me and my life moves onward in some new or altered direction. But change comes from within, and I find myself changing. It is always a brave new world I see, because "I" have changed or who am changing. It is still too soon for me to know what that direction is, but as the classic Otis Redding song says "Change is Gonna Come," and this time I am ready for it. Of course, each of us will have to examine our own mindstream (and see for ourselves) the change that is coming with us -- good, bad, or indifferent. As for me, I have felt this one coming for some time. The sign for me of impending change usually involves the deconstruction of my expectations, quite often a somewhat painful experience. Change frequently requires some deconstruction before I can begin new construction. Any change or altering of direction requires abandoning of the previous one, and so on. As Shakespeare said "Parting is such sweet sorrow." I tend to see my own world as bound in stasis, waiting like the desert for rain for the next burst of change to free me up and turn the wheel of the dharma, as they say. Each solar flare has the potential to turn the wheel of change. I don't know yet much about this particular change, but the signs so far are good. For me this recent time (month or so) has involved a paring down, a reduction to essence, and very much a sense of purification. Call it a Late Scorpio experience. For me this has not always been easy. I seem to be rededicating myself to what has been most important to me, which is an awareness of direct inner experience and perhaps sharing that with others who also are going through something similar. For me, this has been a time of purification, of burning off the dross, an almost Phoenix-like consecration of both space and time. The word "consecration" sums it up. I feel the purification and deconstruction phase is mostly over, but I can't say that I see clearly the exact form of what is coming to pass through the fog of the future. I just know this is the time to separate the wheat from the chaff and I trust in the goodness of the process of change for me. After all, it is I who am changing (that thing I call "me") and I soon won't remember who I was before the change swept in, anyway. That is how total change can be, especially when heralded by intense solar activity. As the old bluesman Freddy King sang "I'm tore down. I'm almost level to the ground." That is kind of how I feel, almost (but not quite) level to the ground. I'm getting there. I can only trust that what will fill this void I sense will be a more pure solution than that which has been washed away. Here I am, teetering on the edge of the future, now almost empty of the past. I have no choice but to trust (and I do) in the pure nature of change to refill my cup with some additional use that I can be to myself, my family, and the world. Like all of us, I want to be used for some good purpose. "Solar Flares: Their Inner and Outer Effects"
"Sun Storms: The Astrology of Solar Activity"